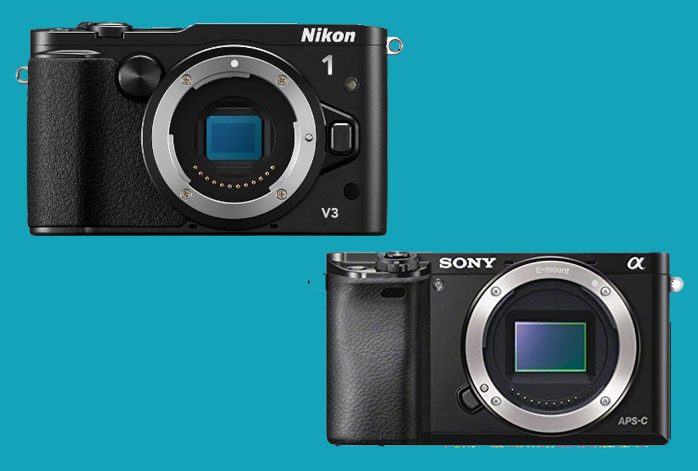 Nikon 1 V3 is armed with an 18.4 MP CX-Format CMOS sensor and EXPEED 4A image processor. While Nikon 1 V3 seems to be quite powerful, you should know that Sony a6000 actually comes with a 24 MP APS-C CMOS sensor. Besides the higher maximum resolution, Sony a6000 also comes with larger pixel area than Nikon 1 V3. As the effect, Sony a6000 is able to produce noticeably better color depth and dynamic range. Sony a6000 is able to generate larger, sharper, and more detailed images, with more accurate colors and black levels. In addition, Sony a6000 also comes with a much higher maximum ISO than Nikon 1 V3. Sony a6000 has a maximum ISO of 51,200 while Nikon 1 V3 only has a maximum ISO of 12,800. The low light ISO of Sony a6000 is also much higher than Nikon 1 V3. As the effect, Sony a6000 can be much more reliable in difficult lighting conditions and more versatile for different purposes. While Sony a6000 is famous for a decent performance in continuous shooting, Nikon 1 V3 is famous for being a beast in the specific task. Nikon 1 V3 comes with a photo burst speed of 60 fps! It is supported by a maximum shutter speed of 1/16,000 seconds, as well as a considerably pretty large buffer capacity. While these features are indeed astonishing, unfortunately, the maximum ISO is only 12,800. Hence, while it captures images very quickly, it may struggle to capture all the details and colors. As a comparison, Sony a6000 comes with 11 fps photo burst, which is certainly sufficient for sports photography, and a pretty standard maximum shutter speed of 1/4,000 seconds, yet the high ISO setting enhances the output quality. Each model has a built-in flash, an external flash shoe, and Wi-Fi connectivity. Sony a6000’s hybrid AF system has 179 focus points while Nikon 1 V3’s has 171 focus points. Both models record videos in a maximum resolution of Full HD (1080p) with 60 fps frame rate, but only Nikon 1 V3 that has a microphone port for high-quality audio input. On the other hand, Sony a6000 features AE Bracketing, a feature for capturing multiple shots with varying exposure values, useful for tough lighting conditions and HDR photography. Nikon 1 V3 does not support AE Bracketing. The only real advantages of Nikon 1 V3 are the extreme continuous shooting speed and the microphone port. Yet, Sony a6000 holds a number of advantages that makes it more versatile and reliable for multiple purposes. Therefore, we recommend you to stick with Sony a6000 for the best value for your money.